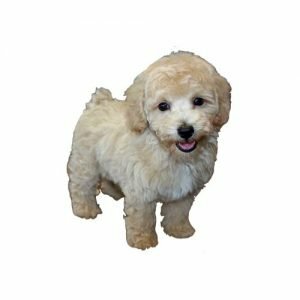 The Bichon poo puppy, also known as a Bichpoo or a Poochon, is a ?? ?designer?۝ dog that?۪s aimed at melding the best characteristics of the Poodle with those of the Bichon Frise. The Bichon poo (Poochon) is typically about a foot high, weighing around 8 to 16 pounds (4-8 Kgs). Its lifespan is approximately 12 to 15 years. Like any hybrid dogs like Poodle Mixes, ? ?Bichon poo temperament and physical characteristics are not as predictable as a purebred, as it may inherit more or less traits from each of its parents?۪ breed. Further, if one or both of the parents are not purebred themselves ??? for example, if they both are Bichon poos ??? the variability in the characteristics of the offspring increases significantly. Bichon poo puppies are highly intelligent and this trait makes them easy to train. Bichon poos are dependent on their owners and are very loyal. They are considered a “lapdog” which means that while they will readily play and interact with children, they also welcome laying on the couch as well. This breed know what “down time” means. They are perfect for kids as well as adults. Both the Poodle and the Bichon Frise are active dogs, so your Bichon poo will have a lot of energy. The Bichon poo does very well in a number of environments. But you need to cater for a daily exercise of at least half an hour. Consider a? ?bit more exercise? ?if she does not have access to a backyard. Bichapoo puppies come in a multitude of colors (not limited to) cream, apricot, black, white, tan. parti colors, chocolate. The bichapoo is a mixed breed and because of this the coat can be either straight, wavy or curly. A larger percent of bichapoo puppies have curly coats but other coats are possible as well. Bichapoos are considered hypoallergenic as they are mixed with two hypoallergenic breeds – the bichon frise and the poodle. Look for the bichapoo to become a purebreed in the years to follow. Do you think the Bichon poo puppy could be a good breed for you and your family? Check out our available puppies page to see all of our adorable Bichon poo puppies for sale! Are you interested in purchasing a Bichon Poo?